The Bull Shark is a commonly known and widely distributed species of shark, known for aggressive territorial behaviour and the ability to live in fresh and salt water. What is the lifespan of a bull shark? A female species has an average lifespan of sixteen years in the wild while a male has an average life expectancy of twelve years. Bull sharks are stout and large; the female is larger than male shark. At birth, they can be up to 80cm which is approximately 2.66 feet. An adult female bull shark has an average length of 2.4 meters which is roughly 7.9 feet long, and they have an average weight of 130kg which is about 290 lb. An adult male shark is slightly smaller with an average length of 2.25m which is approximately 7.4 feet and has an average weight of 95kg which is about 209 lb. The maximum length that has been reported is 3.5m which is roughly 11 feet. However, there is a recording of a female species of length 4m (13 feet). The maximum weight of a bull shark that has been registered is 315kg, roughly equal to 694lb. Are bull sharks dangerous to man? The bull shark is one of the more likely shark species to attack humans. Why is this so? Bull sharks swim close to the shore and therefore have more chance of an encounter with humans. They are also generally unpredictable, territorial and aggressive. According to the International Shark Attack File (ISAF), bull sharks are responsible for approximately 69% of the unprovoked attacks on human all over the world with 17% resulting in fatality. Some experts consider the bull shark the most dangerous shark to mankind in existence. Bull sharks mate during the early autumn and the late summer. After a 12 months gestation period, bull sharks give birth to 4 to 10 viviparous which are born live and free-swimming. The young ones are 80cm at birth and take ten years to attain maturity. Bull sharks give birth in freshwater where the young are free from predators. The young bull sharks grow in the freshwaters after which they migrate out to the seas to find mates. Their diet mainly consists of bony fish and small sharks, including other bull sharks. They can also feed on birds, turtles, terrestrial mammals, echinoderms, crustaceans, stingrays, and dolphins. Bull sharks are also known as Zambezi shark and they are unofficially known as Nicaragua shark in Nicaragua. They can also be known as Zambi, Fitzroy Creek whaler, van Rooyen’s shark or the Ganges in Africa. Due to low bull shark populations, awareness of bull shark population decline has increased, and there have been increasing public and professional interests in enacting legal measures to enhance conservation of bull sharks. Organizations such as State-level natural resource management agencies (U.S.) and Interstate Fisheries Management Councils (U.S.) among others are the leading agencies in promoting the conversation status for bull sharks. 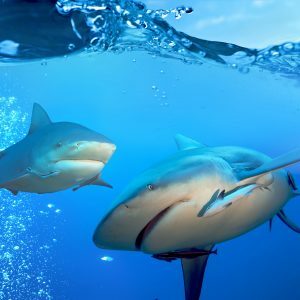 Bull shark fossils have helped scientists conclude that the first skeleton of cartilage is believed to have appeared on the planet nearly 455 million years ago. This fossil of the bullhead shark was given the name doliodus problematicus. Bull sharks are found all over the world in the coastal areas of warm oceans, in lakes and rivers, and at times in deep salt and freshwater streams. They have been found at depths of 150 meters; however, they generally don’t swim deeper than 30 meters. In the Atlantic Ocean, bull sharks are found from Massachusetts to South of Brazil and from Angola to Morocco. In the Indian Ocean, they are found from Kenya to South Africa, India and Vietnam to Australia. In the Pacific Ocean, they are found in Baja California to Ecuador. More than 500 bull sharks are also reported to be found in Brisbane River. Bull sharks are found in a lot of other water bodies across the world.